January 28, 2019 (Joseph Thomas - NEO) - Just as the US has done across the Arab World and in Eastern Europe, Southeast Asia faces political subversion aimed at transforming the region to serve Washington's interests. Thailand is a pivotal Southeast Asian state of nearly 70 million people, with the region's second largest economy, a formidable military and able to boast as the only nation in Southeast Asia to avoid European colonisation. It's decisive pivot away from Washington, toward Beijing and other emerging global powers has led to the current government's determination to replace aging US military hardware with Chinese, Russian and European weapons and the signing of multiple infrastructure project deals with China including high-speed rail networks both within Thailand and connecting Thailand to China via Laos. As a key hub in Southeast Asia's ASEAN bloc, Thailand's influence either for or against American designs in the region can significantly impact Washington's ambitions. Toward that end, Washington currently maintains a growing army of supposed "nongovernmental organisations" (NGOs) attempting to influence and control everything from the media and law, to education, the environment and even elections. Shinawatra supporters carried out an extensive campaign of armed violence against over half-a-year of sustained anti-Shinawatra protests in the streets of the capital, Bangkok, leaving over 20 dead. Despite the number of protesters on peak days reaching well over a million, US and European media downplayed their significance and even wrote them off as "anti-democratic." At the same time, there are examples of that same Western media justifying armed attacks on protesters as merely expressions of "frustration." Selling Violent Subversion as "Pro-Democratic"
Conversely, in order to sell US-backed subversion as "pro-democratic," including recent US-backed protests now taking to the streets of Thailand, the Western media has begun introducing headlines like the Guardian's recent piece titled, "Thailand: biggest democracy protests in years held as military junta delays elections." 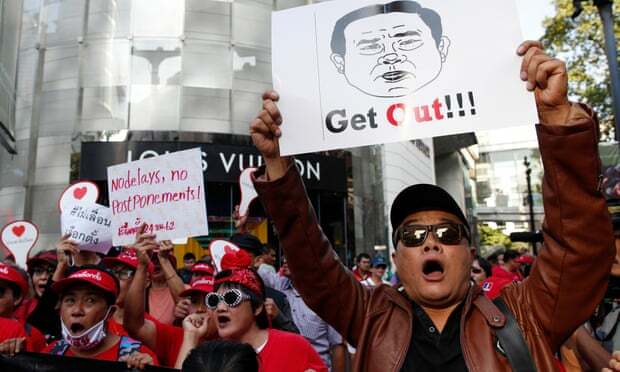 The picture featured in the Guardian's article shows protesters clad in red, the color of choice of Thaksin Shinawatra's United Front for Democracy Against Dictatorship, or UDD, more commonly known as just "red shirts." Yet the only mention of "red shirts" in the Guardian's article appears in the second to last paragraph, attempting to portray them as a separate movement from what are obviously red shirt protests taking place now. 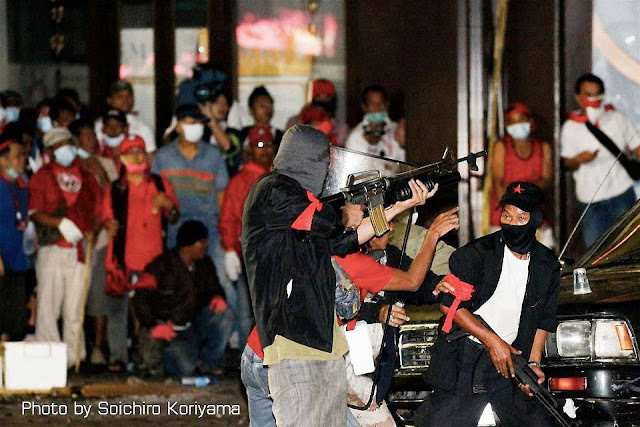 It was also Thaksin Shinawatra's red shirts who carried out violent attacks on anti-Shinawatra protesters in 2014. None of this is mentioned in the Guardian's article and at one point the article even claims the 2010 violence was a result of an "army assault." This is despite the Guardian itself at least partially admitting to red shirt violence in 2010. Twenty-six people have died in clashes on Bangkok's streets, 25 of those on 10 April when troops opened fire on protestors in pitched battles across the city. One woman died on Thursday night when five grenades, allegedly fired from within the red shirts' barricaded compound, hit the city's financial district, including a railway station where a commuter-packed train stood. Eighty-six people were injured. Even in this tacit admission of red shirt violence, the Guardian attempts to spin events as an "army assault" rather than a response to armed terrorism. The systematic dishonesty of papers like the Guardian in regards to Thailand's ongoing political crisis should be alarming, especially attempts to cover up or justify armed terrorism. Not least because it fits a similar pattern used to help exasperate violence and eventually regime change... and even Western military intervention in nations like Libya, Syria and Ukraine from 2011 onward. In Thailand's case, a concerted campaign to smear the nation's military and constitutional monarchy has been ongoing for years. Even across the alternative media many have taken the bait rather than critically examining the so-called opposition; who funds them and what truly motivates them. The fact that the Guardian published an article with Thaksin Shinawatra's red shirts featured prominently at the top, and still attempted to sell the protest as "pro-democratic" illustrates that not only does the Western media seek to mislead the public regarding the true nature of Thailand's political crisis, but holds in contempt the public's ability to research the crisis on their own. Knocking Thailand out of China's orbit, either by successfully replacing the current government with a client regime answering to Washington, or by dividing and destroying the nation to a degree that it is no longer a useful economic, political or economic ally of Beijing, benefits Washington and fits into a wider global pattern of Western political meddling and subversion. The only question left is through which political parties and organisations will this agenda be pursued? 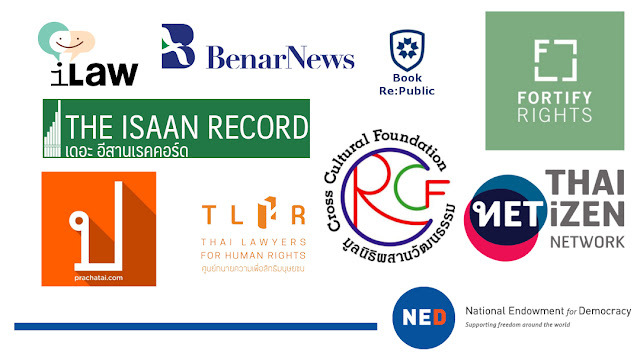 By following National Endowment for Democracy and Open Society funds to organisations like Prachatai, Fortify Rights, Thai Lawyers for Human Rights, Thai Netizens, the Cross Cultural Foundation, iLaw and many more, all openly involved in current anti-government protests padded with Thaksin Shianwatra's red shirts, with Shinawatra himself a former Carlyle Group adviser and the recipient of years of US lobbying services, we can easily identify the "who." The alternative media will play a pivotal role in either preventing Southeast Asia from falling victim to the next "Arab Spring" or "Euromaiden," or aiding and abetting it through shortsighted, ideologically and emotionally-driven analysis.